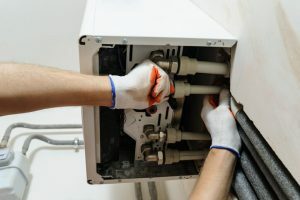 At Tuckey Mechanical Services, we provide South Central Pennsylvania businesses with water heater maintenance, repair and installation services. 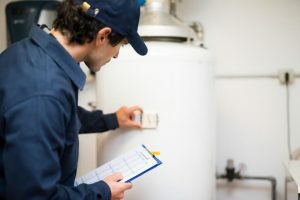 When your business is experiencing water heater issues, our team of licensed technicians can service any make and model, providing the maintenance or repairs you need to get your business back to full operation. We work with businesses large and small. No matter the size of the repair, your complete satisfaction is our primary goal. *For immediate water heater service, call us at (717) 249-1535.
Business owners can expect to get 10 to 15 years of use out of a commercial water heater, but proper maintenance can help you reach the top end of that spectrum. At Tuckey Mechanical Services, we walk alongside your business every step of the way. We can perform preventive maintenance even in the earliest years of your water heater’s life. 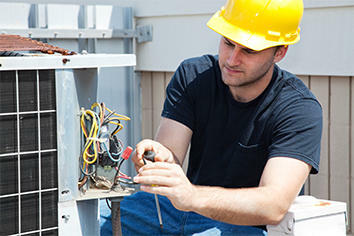 We can provide necessary repairs, and we can perform professional new installations. If you have questions about what’s best for your water heater, our team of licensed technicians can also provide expert guidance. For gas, electric and heat pump water heaters, including both tank and tankless models, contact our team to learn more. Are you looking for on-demand hot water? If so, you should consider tankless or point-of-use water heating systems. Tuckey can help you sort through the details and make the best decision for your unique application. Tankless water heaters help conserve water and energy by only heating when you need hot water. Point-of-use water heating systems work similarly, only the heating takes place near the spout or faucet – hence the name ‘point of use.’ Like with tankless water heaters, point-of-use systems deliver hot water on demand and help reduce your monthly water heating expenses. It’s important to move quickly when your water heater needs repair. Waiting can affect the long-term function and efficiency of your water heater, decreasing its usable life and drawing you closer to a full replacement. By investing quickly in necessary repairs, you can keep your water heater working efficiently. You’ll get the performance you need while maximizing your equipment’s usable lifespan. At Tuckey Mechanical Services, we can repair gas, electric and heat pump water heaters, both tank and tankless. As a business owner, you may be reluctant to schedule maintenance because of the expense. What you may not realize is preventive maintenance can save you time – and money – over the long-term. Start by regularly servicing your water heater to ensure peak efficiency. This is particularly important in the fall before the coldest months of the year arrive. Preventive maintenance will also reduce your regular water heating bill, and save you money on repairs and replacements down the road. Whether your business is in Chambersburg, Carlisle, Harrisburg or the surrounding area, Tuckey can be your expert service provider. We deliver water heater maintenance, repair and installation services your business needs. We work on all makes and models, so your business can become comfortable and functional again. Contact us today to learn more about water heaters for your business in Harrisburg, Carlisle or Chambersburg. "Mike Lebo is Tuckey Mechanical’s greatest asset. He follows thru gives sound recommendations and provides effective and sound guidance and recommendations! His work and guidance on the installation of our new boiler at our Church and his recommendations on the updating of our HVAC system have been exemplary. His experience and reputation are unparalleled. Absolutely an outstanding professional!!!!!"